Paul Michael Gritz, gone way too soon, passed away unexpectedly at home on November 23 in Lynden, WA. One of six sons, Paul and his twin brother, John Gritz, were born at Miami Beach Naval Air Station, Florida. They grew up on a variety of Naval bases, including Florida, Ohio, Kauai, HI, and San Diego, and moved to Fillmore in 1958. Paul graduated as Senior Class President of Fillmore High School in 1963. He was a member of Boy Scout Troop 406 in Fillmore and attended Ventura College, Humboldt State College, Arcata, and Methodist College in Fayetteville, NC, where he graduated in 1995. In May of 1965, Paul married the love of his life, Janice Imhoof, who stayed by his side through 27 moves over 53 years. He worked as a firefighter for the U.S. Forest Service in the Los Padres and Sierra National Forests, and as a California Highway Patrol officer in Ventura County. In 1973, he joined the U.S. Army, earning his airborne aviator wings at Fort Rucker, AL and his senior parachutist wings at Fort Bragg, NC. He flew both helicopters and fixed-wing aircraft, serving in Germany, Korea and Turkey as well as Fort Bragg, NC and the Military District of Washington, DC. Paul was the command pilot for the Army Commander-in-Chief Europe for five out of his nine years in Germany. As part of his service, Paul was honored to serve as the pilot for General “Lightning Joe” Collins, during the 40th anniversary of D-Day in St. Mere Eglise, France. 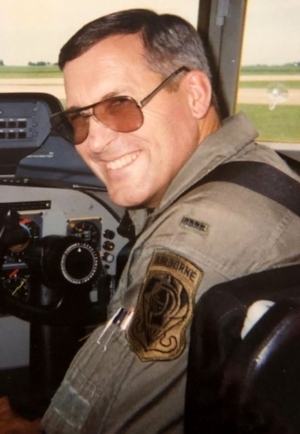 A volunteer senior ski patrol officer in Germany, he also piloted the Golden Knights parachute team prior to retiring as Chief Warrant Officer IV in 1995. After retirement, Paul was a corporate pilot for Northrup-Grumman in Los Angeles and flew corporate aircraft out of Concord and Sacramento. He acquired almost 15,000 hours during his military/civilian career and was an instructor pilot for the Huey and C-12 aircraft. He and Janice lived in Lincoln, NE, Los Angeles, Roseville, Clarksville, TN and Lynden, WA. Throughout his life, Paul loved telling stories and jokes and, with his outgoing personality, never met a stranger. Beloved husband, father, grandpa, son, brother, uncle, cousin and friend, Paul is survived by his loving wife of 53 years, Janice; sons John Patrick (Melissa) Gritz of Mason City, Iowa and Sergeant First Class Jeffrey (Kate) Gritz of Fort Campbell, KY; grandchildren Angus Gritz of Seattle, WA and Teagan Gritz of Roseville; twin brother John (Gloria) Gritz of Eagan, MN; brothers Rocky (Mary Beth) MacKenzie of Burbank, Bob (Anita) MacKenzie of Olympia, WA, and Tom (Charmaine) MacKenzie of Atlanta; sister Eva “Missy” Gritz of Saugus; his namesake nephew, Paul “Marty” Gritz of Mason City, Iowa; additional grief-stricken nephews and nieces; and many other loving relatives and friends. He was predeceased by his parents, Paul H. “Doc” Gritz and Coral MacKenzie, and older brother, Toby Gritz, also an aviator and 1962 graduate of Fillmore High School. Friends and family are invited to a Celebration of Life and burial with full military honors at 11 a.m. on Monday, Dec. 3, at Ivy Lawn Cemetery, 5400 Valentine Road, Ventura. Donations in Paul’s memory may be made to Boy Scout Troop 406, 644 Clay St., Fillmore, 93015, in care of Brett Chandler.